In addition to its history of labor violations, Forever 21 has been sued more than 50 times for allegedly stealing the work of other designers and passing it off as their own. Despite this long legal history, Forever 21 continues to get away with it: The chain has never lost one of these cases in court. Left: An Anna Sui dress on the runway. Right: Forever 21's version. Sui was copied by Forever 21 more than 20 times before she took legal action. Forever 21 has copied everyone, from big brands like Anna Sui and Diane von Furstenberg to smaller, independent designers like Trovata, Foley + Corinna, and 3.1 Phillip Lim. The chain has most recently been sued by Feral Childe, a fashion label run by a pair of friends named Moriah Carlson and Alice Wu, for producing clothing out of a printed fabric that looks virtually identical to one of Carlson and Wu's original prints. Left: A Betsey Johnson dress in a print designed by Carole Hochman. Right: Forever 21's "interpretation." The thing is, textile prints are subject to copyright. A garment's overall design is not. "At first it boggled my mind that Forever 21 wouldn't steal the unprotected garment design, but would steal the protected fabric print," says Fordham University law professor and fashion legal expert Susan Scafidi. "Because as a legal strategy, that is a complete inversion — it makes no sense. If you're going to steal, steal the things that aren't legally protected." Top: Feral Childe's print. Bottom: Forever 21's. I asked if Wu and Carlson were surprised that Forever 21 apparently duplicated their print, which they named "Teepees," given that if the company had copied one of the garments the print was on, the chain would have been on much more sound legal, if not ethical, ground. "We were surprised to be copied at all, because we make what might be considered a very niche product in both print design and silhouette," the designers wrote back. "We were particularly astonished by the choice of Teepees since it is so idiosyncratic and signature Feral Childe. We like to play hidden pictures with our prints and silhouettes and there are teepees, crowns, and pennants in the print that may not be apparent at first glance." Teepees, crowns, and pennants which all appear in the exact same configurations in Forever 21's print, too. The effect of copyright has been largely positive for the textile industry. "It's helpful for designers who have an interest in using prints, and the wherewithal to create their own prints, to get some protection," says Scafidi. "Because they can't for their clothing designs, but they can at least for their textiles." Left: A Diane von Furstenberg dress. Right: You get the idea. Scafidi characterized Wu and Carlson's case as very strong: "My money's on Feral Childe for this one." Forever 21's print looks like it could be a photocopy of the original design — "when you get close," says Scafidi, "and you start looking at the cross-hatch marks, and the details, it really is very identical." "We're confident in our attorneys," wrote Wu and Carlson. Attorneys, they point out, who have successfully represented plaintiffs in other textile design copyright infringement cases. Left: A Foley + Corinna dress. Right: The Forever 21 dress. 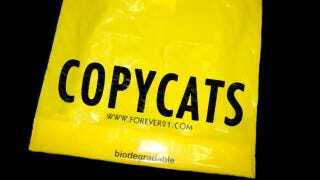 At first, said Scafidi, she was confused by Forever 21's tendency to get sued again and again over the same issues with taking other people's intellectual property. "But then over time I realized that they've been caught so many times, they've been publicly exposed so many times, they've even been sued — although many fewer times, because all they do is settle — and the lightbulb went off: this is just part of their business strategy. They go ahead and they take what they want, and when they get caught, they pay up. It's probably cheaper than licensing it in the first place." Forever 21 did not respond to requests for comment. Scafidi has spoken with many attorneys over the years who have pursued Forever 21 for copying their designer clients' original works, and says that the company's response is methodical, even phlegmatic. "It's not as though their attorneys are surprised and shocked that their client has been caught copying." When Forever 21 settles a dispute over copying — which, again, the company has done more than 50 times in its 27 years of existence — it typically includes a non-admission of guilt, financial compensation to the designer whose work was copied, and a confidentiality agreement. Left: A dress by 3.1 Phillip Lim. Right: Guess who! Forever 21 continues to copy because copying a dress design — even copying a dress design clearly made first by someone else, even copying a dress with stitch-by-stitch exactness — isn't in and of itself illegal in the U.S. "Because the law has been so reluctant to focus on fashion specifically as an appropriate subject for protection, has been so reluctant to acknowledge fashion as a creative medium, we — and by 'we' I mean the legal profession — have been called on to pull and stretch other areas of intellectual property to cover bits of fashion," Scafidi explained. "So trademark can be stretched to cover the label. Trade dress, a subset of trademark, stretched a little further to cover very iconic designs. Copyright pulled in to cover jewelry and to cover fabric prints, jewelry because it is like a little mini sculpture and not merely a useful article. Occasionally, patent pulled in to protect functional elements, like Velcro, or a zipper...So intellectual property sort of stretches these bits to cover parts of fashion, leaving most of fashion naked and exposed. Which is why the need for the additional law, to finally say, Look, we can cover the core as well. We can cover the central aspect of any garment, and that is its actual design, if it is indeed innovative." Scafidi consulted on the development of one such bill, supported by New York senator Chuck Schumer as well as fashion and retail trade groups, which is currently under consideration in the House. Top: A row of shirts made by Forever 21. Bottom: A row of shirts by the fashion label Trovata. These shirts were at the crux of a lengthy legal dispute between Trovata and Forever 21, to date the only time the California chain has had to face a jury in a knockoff case. Forever 21's main competitors — retailers that share a business model built on selling rapidly mass-produced runway-inspired stock, like H&M, Zara, and Topshop — don't knock off designers' works with anything close to Forever 21's avidity, Scafidi pointed out. "They're based in Europe," she explained, where copyright protection does extend to clothing designs. This, she argues, is better for the consumer, because anyone interested in, say, "those white blazers that were all over Stella McCartney's runway last season" or "those Prada stripes" can choose between H&M's interpretation, Zara's version, and Topshop's. Making chains unable to just rip off an existing garment exactly forces them to be creative about it. I have in the past overly trusted people and was, in turn, let down by some. Since then I have learned the difference between putting faith into people and blindly trusting them. "We've never settled," she says of the label's lawsuits, making unquivering eye contact. There's a first time for everything. Or a fifty-first. Anna Sui image via; Betsey Johnson image via; Feral Childe print image via; DVF image via; Foley + Corinna image via; 3.1 Phillip Lim image via; T-bags image via; Trovata image via.